I recently heard someone in a fly shop say, “OK, I just wanna grab something and go.” They were facing a wall bursting with fly line options. Specialty lines and specialty tapers abound, and it’s hard to argue that choice isn’t a good thing, but there are some who just don’t have the time, or inclination, to look deep into the fly line catalog. For those, there are general purpose lines. 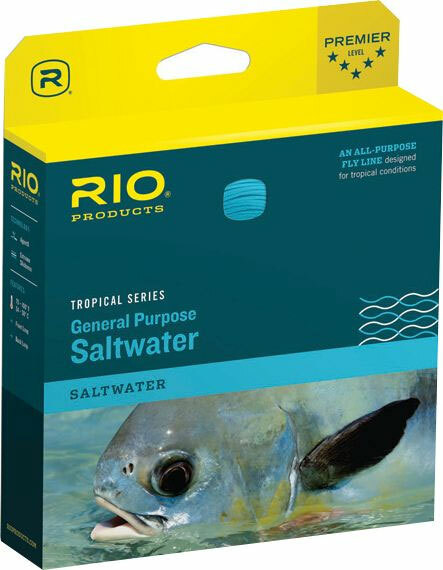 RIO has offered their Saltwater Series General Purpose Tropical line for a few years now and I always load one of my reels with it. As its name suggests, the line covers many bases, so it’s an excellent choice for anyone with a “target whatever is currently swimming” attitude, or who is limited to one or two line spools. This warmwater line has a hard tropical coating to resist coral damage. It’s also made slightly heavier than its rating in order to handle large saltwater flies and for quick and easy loading, a feature all the more appreciated in a salt water environment. The 3-line series covers all of your salt water bases: a full floating line, a floating line with a 10-foot clear intermediate sink tip, and a full intermediate sinking line with a 10-foot clear tip. Highly recommended.